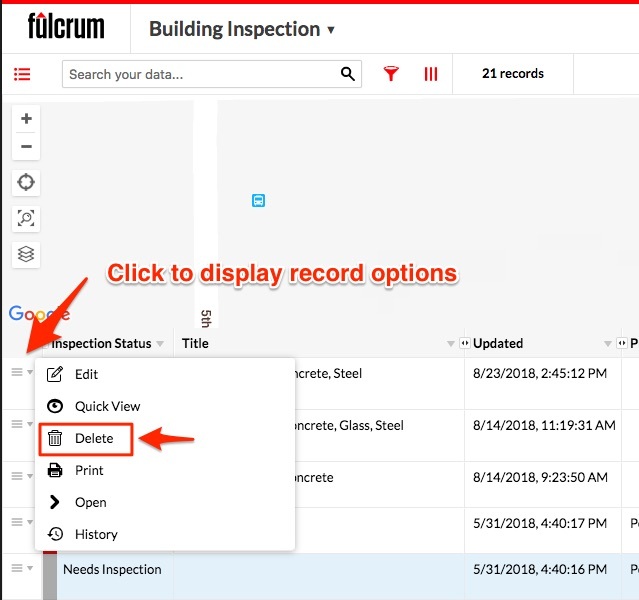 Learn about the multiple ways to permanently delete records from your Fulcrum account. Be careful when deleting records from Fulcrum. Unless you’ve exported and backed up your data, once a record has been deleted from the system, it cannot be recovered from within Fulcrum. If you plan has the ability to export the full record history it is possible to export the full history and locate the deleted record from the exported data file. Only records that have not been synced can be permanently deleted via the mobile apps. Deleting a record which has been synced with the server will remove the record from that mobile device, but it will still be available in the system. Once a record has been synced, it can only be deleted from the system via the web admin console or API. If you want to bulk delete records, you should use the Records API. The Fulcrum Node, Fulcrum Python, and Fulcrum Ruby API wrappers all support record deletion as well. Fulcrum does not have any native way to bulk delete records. One option for deleting *all* records in a form is to use the "duplicate form" option on the form settings and then delete the old form. The "duplicate form" will copy your form structure without any of the records. Once you have duplicated the form, you are able to delete the old form from your account. If you would like to include some records you will have to import those from the original form.